A week back when I was photographing people, Neferia came to the shoot wearing this pretty patchwork dress. I put it on today and decided to wear it with a wash of neutral colors. I like how comfortable my avatar looks! IRL, I'd put it on and head straight for a fire with some marshmallows for roasting and hot cocoa. In SL I think I'm going to put up Christmas decorations today! Not only has Schadenfreude gone nuts with a tree farm in Horst, but /artilleri/ has too, with a Christmas Workshop where the bowling alley used to be. IRL, I might just put up my tiny Christmas tree ... it's small and plastic until my toddler has the self-restraint to not climb the tree, but we make homemade ornaments every year. D: aww, alyx! pine barf sounds so xmassy! 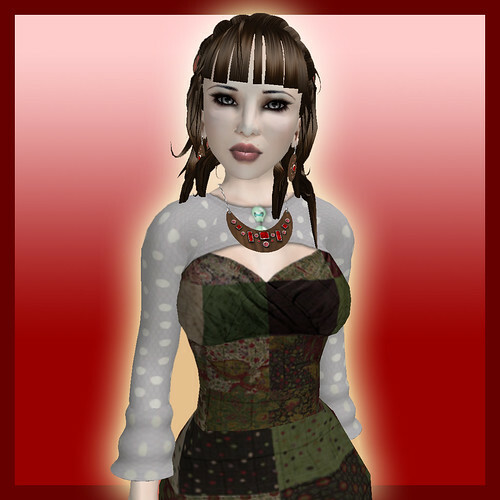 Esme -- hellifiknow, sadly, Nef handed me the frock when I said I liked it. But hey, excuse to shop more at Ivalde! I try to find you via the SL search, but it says you don't exist - everything ok? I sure do exist! Dunno why SL was saying I don't! "Achariya Rezak" is the SL name? I just tried it again and SL says "Not found". oh how funny. achariya rezak is my IRL name -- i wanted something close in SL and came up with achariya maktoum. sorry for the confusion! d'oh! don't think i've gotten review copies from y'all! But are the boots made out of gryphon skin?